The Grand Strategy of the post-Global Financial Crisis era was simple: maintain the status quo as is. The Obama administration’s major policy initiative, ObamaCare, a.k.a. the Affordable Care Act, was nothing but the formalization of the existing status quo in healthcare, i.e. the taxpayers subsidize private-sector profiteering. The same can be said for every other sector of the economy: nothing really changed, just more of the same. 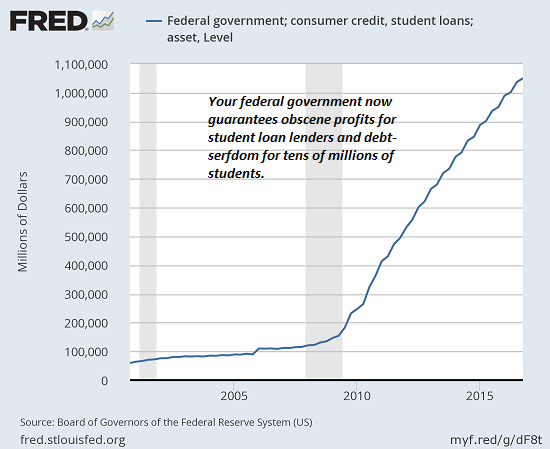 Higher education: nothing changed, just more student loan debt was issued. The defense industry: more of the same. Global War on Terror, a.k.a. The National Security State–more billions sluiced into the shadows. President Obama was a master of telling everyone what they wanted to hear while changing nothing in the basic structure of the Empire. The Imperial Imperative of destabilizing nations that didn’t meet with Imperial approval continued unchanged. The murder-by-drone campaign expanded, the support of a hopelessly corrupt regime in Afghanistan continued unchanged, and so on. 2. 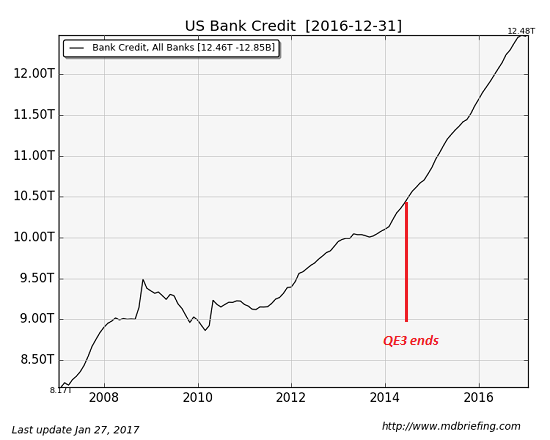 The self-correcting mechanism of the status quo–the self-serving pursuit of maximizing private gain–naturally yielded up whatever policy tweaks were deemed beneficial/ necessary. If there is any dividing line in America today, it’s not political: it’s the division between those who see the status quo arrangement as marvelously successful, and those who see the tiller lashed down tight as the great ship heads for shoals that will rip the hull to shreds. 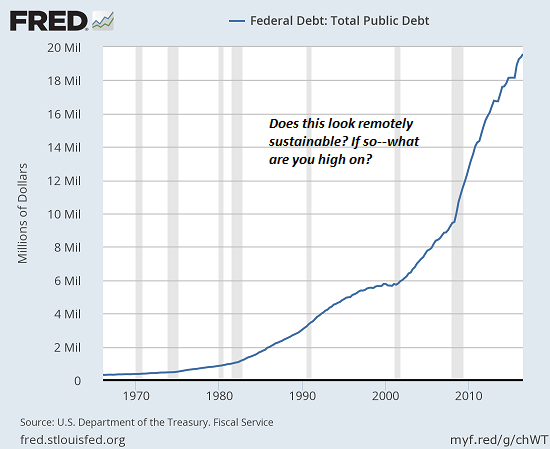 Clearly, the core strategy of maintaining the status quo is to borrow and spend trillions of additional dollars every year. 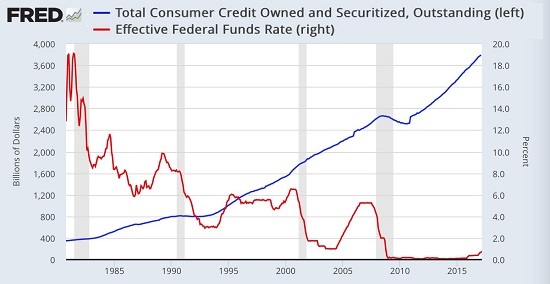 Fortunately for the status quo, near-zero interest rates have created the comforting illusion that debt doesn’t matter because it’s almost free. There were LOTS of reasons Hillary Clinton lost the 2016 election and none of them had anything to do with Russian "meddling"